We thought we’d share with you, an event that happens every month here in Hawkes Bay – a gathering of creative people who come together to share great coffee/food, inspiring conversation, ideas, knowledge and friendship. 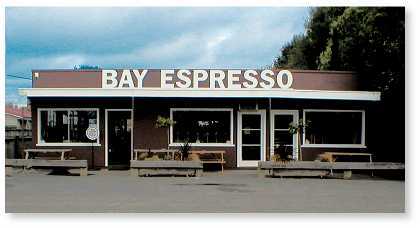 We call ourselves ‘Made It Here’ and usually meet on the last Sunday of each Month at Bay Espresso ½ way between Clive and Hastings. 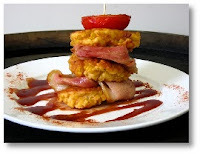 Their corn fritters - YUMMY! It’s an open event for all creative types whether selling on-line, at markets, to friends or are just thinking about it. We also welcome all types of arts/crafts genres. As a matter of interest - It was from the original group of 9 attendees of ‘Made It Here’ that we came up with the idea of New Zealand Handmade - a place to network with artisans from all around the country and promote members wares to the world. We now treat NZHM as a separate entity so that we can give equal attention to both – but it just goes to show great things can come from small beginnings. We would encourage other creative types around New Zealand to start up similar gatherings in your neck of the woods – there are already two well known established groups – Crafty Business in Christchurch and the Auckland Craft Collective in Auckland – do get in touch with them if you’re in those areas to find out more. But if you’re further afield how about initiating your own? Sometimes it’s just brilliant to be able to share local tips on suppliers/events, show others your latest creation and seek their feedback, organise a local group exhibition, or know other stall-holders at a market that you can get to mind your stall while you grab food or a comfort stop!! I like this banner - says it all! One of the best ways to initiate a meet-up can be through on-line sales sites – Katherine from Sleep and her Sisters started our group by contacting Etsy sellers in Hawkes Bay, you could do the same, or post on the Felt forum, contact organizations such as ‘Creative Taranaki’ (example), even use social media sites such as Facebook and Twitter to get the word out, find a great venue and take it from there.